Spent a year on Twitter some time back, in an attempt to attract attention to Truthscoop. Do m'bit to advocate and cause healthy noise, in among a window into the public-ish discourse. Noticed, many 'followed' or re-tweeted, offered no response. Nothing back, except on the rare occasion, a 'like'. (Exceptions granted and those who did otherwise). Get the big numbers and names, might be too sensitive and selective. Truthscoop-like, with seeming wild-views, out the accepted talking-order. But some knew me -- from this or that -- old associates etc, all too... 'something else' to go near. Found those who most-acknowledged and took an interest, were from three 'causes'. Those fighting the child-abuse cover-ups. And the handful on Syria, and same-again those, all about Yemen. Here people followed Twitter/scooptruth and especially the Yemen-eyed (small) crowd of activists. What they liked was my, here and there, right-standing comments. Tweet/words/links/images back -- too rarely appearing. Not about such exceptional content and because of this, 'chose' mine to re-tweet.? No, sometimes, it was, Only... me, and three or four, retweeting. At and All. One time a call went out for a time-based (think 'on one day') campaign, to tweet-bomb or whatever, called. Tweets to figures of influence; "to please wake-up and see the suffering. Must somehow stop/slow-down, the establishment-contrived hate and war bombardment". Somehow, show, we care enough, to at least type and send a shout out. The people in/from Yemen might have thought no-one gives a fig for their struggle. Attention on the handful of relevant Tweeters went a small way to shatter the media silence. Breakthrough and not all about people and places -- but not Yemen. To try direct, far and wide, the serious concerns on Twitter, to raise up the protest and pressure the Press. Uptake was... pathetic. All the while assumed, supposed social-concern-ers had... let's say; "other things to do and twit. about". S. Awan and James (Crimes) got my anger and call for outrage up and squawking. Vanessa Beeley and one or two: Would not shut-up, and pay -- Yemen -- attention. On Twitter a half a dozen or so, prominent Yemen-focussed people's, with some in and around the land itself. They were the main encouragement to bother sticking with it as long as did. Ain't that the madness. Ain't this, the mad one. Finally, over the past few months, c/o Saudi stir-up with behaviour, pressure comes to the Govt. of the UK etc. The press/media making a bit more fuss and enquiry about this beleaguered and battered nation. Someone dares and gets a bit ranty in UK Parliment. One of the rags goes all serious about the bombs and makers. The war the UK etc. is driving and directing. Strategic and political? It's the usual claiming-stakeholders for misery and intended destruction, who happen to coalesce. While on-the-ground (and air) logistics? Made in Britain, with a capital B. Providing personnel to manage and train. All available to confirm, buried in official disclosures but softened and massaged to remain discreet. Aka Covered-Up. 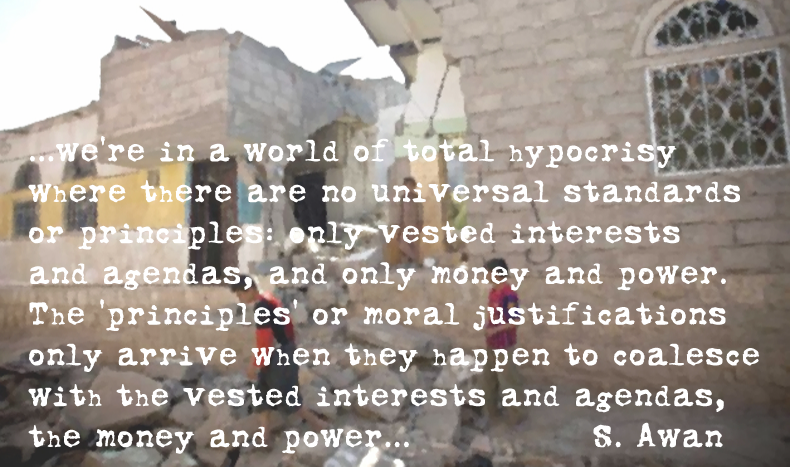 As [The] ‘principles’ or moral justifications only arrive when they happen to coalesce with the vested interests and agendas, the money and power. So what's coming together to coalesce and, is this tantamount to saying, we're stuffed. That behind the MP's, and try evaluating the 'behind' the Globalists/City/Secret Soc. cult, we're in a head-lock? 'Knocking' for the ref. to stop the fight. Have they so got enough-over, the ease with which to come together and con us; there are ‘principles’ or moral justifications that appear benevolent -- when all the time, its marriages of convenience? With not quite the brazen evil rub-noses-in and pretend and go too loud a revealed deception. Leak enough to keep the lid firm closed. Jobs c/o Saudi-funding -or- children through to oldies smashed to smithereens. Some writhing in avoidable pain through the sanctions and starvation. Of meds, water and food. Could go on but time is tight and a little one -- Truthscoop -- is an exercise and out of principle; gotta spit.